We’d love your help. 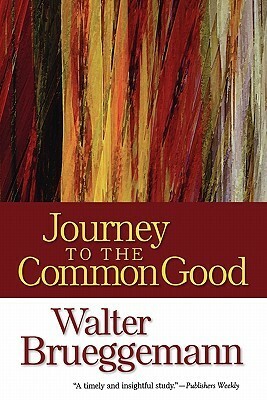 Let us know what’s wrong with this preview of Journey to the Common Good by Walter Brueggemann. To ask other readers questions about Journey to the Common Good, please sign up. does the author define prophet? Every person of faith in the United States should read this book. Heck, everyone in the world should read it. What a wonderful world we would live in if we truly sought the common good. This is a particularly powerful book at this time of crisis in the US with important elections looming. Too much social justice based on a "Social" gospel. Not enough Real Truth. I have been disappointed with Brueggemann. This is a must read book for our times (2017-current, 2018). Dr. Brueggemann provides us with a clear understanding of the wonderfully complex book of Isaiah and it's potential for us today as faith-led people of the world (and especially the USA) strive to deal with the complex political, social, and economic issues of our time - not the least include who are we as a people? How are we to act towards the poor, the alienated, the disenfranchise and those that are different (the "other")? These q This is a must read book for our times (2017-current, 2018). Wow. I loved this read by Brueggemann - the scriptural basis for the common good in the OT was helpful and the lens through which he reads the Exodus story was beautiful. I am extremely thankful for this book, and I feel like I might be coming back to it again and again. Highly recommended. Seeking the common good is something that most Christians, at least in theory, consider integral to the faith. But what does it actually look like? Where do we find inspiration or instruction for the journey? And where will the journey take us?These are the questions Walter Brueggemann explores in Journey to the Common Good (Westminster John Knox). As a world-renowned Old Testament scholar, he sets out to locate the answers in three places: Exodus, which sheds light on the journey from anxiety t Seeking the common good is something that most Christians, at least in theory, consider integral to the faith. But what does it actually look like? Where do we find inspiration or instruction for the journey? And where will the journey take us?These are the questions Walter Brueggemann explores in Journey to the Common Good (Westminster John Knox). As a world-renowned Old Testament scholar, he sets out to locate the answers in three places: Exodus, which sheds light on the journey from anxiety to neighborliness; Jeremiah, an invitation to choose life over death; and Isaiah, which helps us move from loss to restoration. I have enjoyed most everything I have read by Brueggemann, and much of my thinking and values are informed by his work. That's why this book disappointed me. It still holds a strong message of hope and imagination employed for justice, but some of the rhetorical choices and logical slips presented a seemingly rushed, popularized version of scholarly exegesis. Still, the book is informative and challenging, worth reading even if not one of his best. I am part of a tradition that hears the scripture primarily in a personal, individualistic way, with the first question being asked - what does the text say to me about my relationship to God? Brueggemann sees the Old Testament texts addressing the social order, even with competing views, but inviting us to envision society, nation, city, neighborhood in a different way. He expanded my appreciation for the scope of scripture and has me hearing some Old Testament texts in new ways. I read this "little" book with a group in church. I say "little" because when we first saw that it's only three chapters long we thought we'd be done with it in three meetings. Wrong! It's short but deep and well worth reading. Since I was studying the book of Revelation at the same time it amazed me how many of the same messages and calls to action that are found in Revelation are also brought out by Brueggemann in the Hebrew prophets. Very good. Not always smooth reading, but many good points and prophetic insights make it well worth your time. I had the good fortune to hear Brueggeman speak on this theme last week; the book and his talks added weight and insight to each other. I don't agree with everything, but found his perspective on God's law v. Pharaonic law and life in the wilderness after life in Egypt to be quite enlightening. Also, enjoyed thinking about Isaiah as Loss/Grief/Hope/Moving forward. Brueggemann is a pretty sharp biblical scholar. I am mostly reading for personal edification, and not part of a directed study. If I was, I am sure I would get more from the author's thesis. As it is, much is outside my knowledge base or I would appreciate more, I feel sure. A nice clear exposition of some hebrew texts by leading scholar. Very accessible and give me a couple of new insights on the power of subversion within a text. The first and last chapters were the most interesting to me. I thought that the way he presented the idea of Pharoh in our times was facinating and a new way to look at Power, Wealth and Wisdom. Get it. Read it. That is all.